Germany-based sensor and control manfuacturer ifm efector, inc., with U.S. offices in Exton, PA, has introduced a new line of compact, low-profile safety light curtains that can provide finger, hand and body protection in a variety of industrial applications. 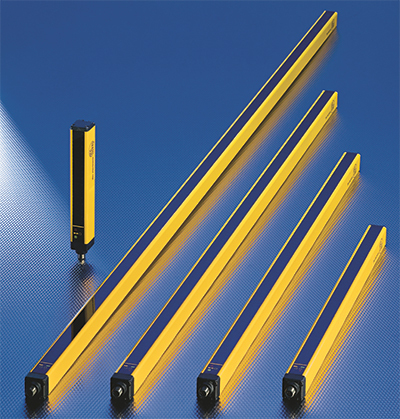 ifm Type 4 light curtains provide a multibeam barrier of infrared light in front of a hazardous area. The light curtain continuously monitors itself for faults. A tight effective aperture angle of 2.5 deg. reduces risk of optical short circuits, and the curtains include duplicate critical components and circuits in order to provide a backup system should the primary system fail. The light curtains are offered in protective heights of 160 to 1510 mm, in 150-mm increments. Their slim housing design measures only 28 by 30 mm for an easy, nonintrusive fit in tight spaces. The 24-V DC units have a protection rating of IP65/IP67 and an infrared wavelength of 950 nm. Options are available for muting and blanking applications.